So, the only information we have access to (in a web page) is an approximate/noisy "tNow" values -- and nothing else! FYI: There is a "tFrame" time argument passed to the rAF callback. Most browsers simply pass in the now() time. However, Chrome passes in the vsync time obtained from the OS. Firefox passes in a completely faked time. The goal: The goal is to create an algorithm that can extract/compute an incredibly accurate "tTimebase" and "tInterval" from the above formula using ONLY the numerous, but noisy, "tNow" times seen. The complication is the impact of the "ERR" term, missing frames, etc. In Chrome, "ERR" can be up to 1 ms on fast systems, up to 2ms on slower systems, and up to 4ms on notebooks running on battery power. In Firefox under Windows, the "ERR" term can (1) be all over the place, and (2) permanently phase shifted several milliseconds past true vsync. See Firefox is broken for details. Filter incoming tNow frame times: Discard times where a run of several inter-frame times are not 'stable'. The goal is to filter out all major jitter, leaving only times with minor jitter remaining (Y values). Also filter to account for (slow) browser startup/overhead, and being run in an inactive web browser tab. Compute a (one-time) first/rough "tInterval" from an initial set of filtered times. Every so often, compute a 'line of best fit' (needs X values, computed from smoothed times and a 'prior' "tInterval"), which generates a "tTimebase" and a new "tInterval" (for the next iteration). Adjust the computed "tTimebase" such that all "ERR" terms in the 'line of best fit' are non-negative. Validate the results. If there is too much variation in the "ERR" terms, start over. Allow the algorithm to be run over an extended period of time, while still using a fixed memory and cpu overhead. Conclusion: The algorithm in practice works incredibly well. It is able to 'lock into' the VSYNC "tTimebase" and "tInterval" with a high degree of accuracy in very little time (within seconds). 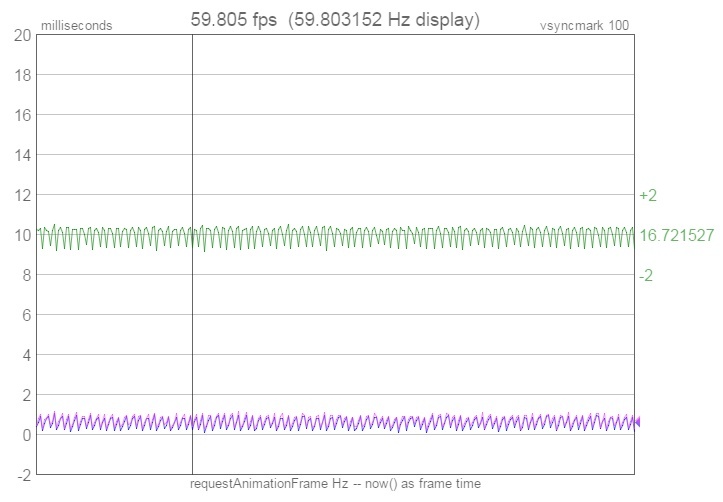 Use rAF time: If running Chrome on Windows, visit vsynctester.com, click on the gear icon, check the "Use rAF time arg as frame time" option, which will then feed the vsync time Chrome obtained from the OS into the algorithm -- and watch how quickly an accurate Hertz value is computed. Reducing ERR: Regardless of how many frames there are, the ERR term is added at the end -- which means that the ERR is effectively spread over that many frames. So the more frames you sample, the smaller the error per frame becomes, and the more accurately "tInterval" will be computed. And then the best fit line formula finds a (consistent) 'path' through the 'ERR' jitter that further reduces the 'ERR' impact. Analogy: What is the height of ONE quarter? Measure one quarter and you will be off by 'ERR'. But now stack 100 quarters and measure all 100. Your measurement will still be off by 'ERR'. But then you divide your answer by 100 to obtain the height of one quarter, and you have effectively divided your 'ERR' by 100 as well!